I have a chapbook coming out this summer! It consists of a series of prose poems I've written based on family daguerreotypes that were a gift from my paternal grandmother. A daguerreotype is the earliest form of photograph, and the word is most commonly pronounced "dag-AIR-oh-type." If you would like to order a copy of my chapbook, it's currently available with free shipping through June 20. Orders will be mailed on or soon after July 20, 2007. You can order the chapbook online through Finishing Line Press or at amazon.com. My people are quiet, at least about the past, and they pass down objects with few words to accompany them. Ten years ago, my grandmother gave me a box of thirty old photographs in small pressed cases. I asked her who was pictured and with a couple of exceptions, she had no idea. My great-grandmother, who died twenty years before I was born, had labeled only a few of the photographs and some of these with question marks. I feel a need to connect somehow with my family’s distant past. I search in these faces for mutual understanding and release, for the message that I can write what I must and live as I must. My ancestors are kind, but consumed with their own struggles of conscience, nagging toothaches, and burdens of responsibility. They have only so much time for me and only so much patience for invention, be it artistic or scientific. 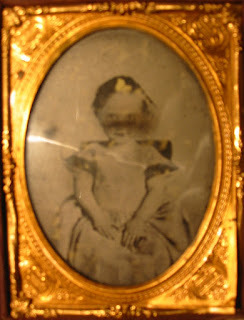 They lent their images first to daguerreotypists and then to descendants. I am grateful for what they’ve revealed, and I respect what they cannot. 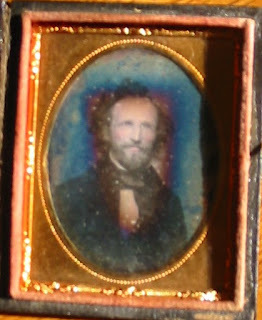 Click here to see all of the daguerreotypes. 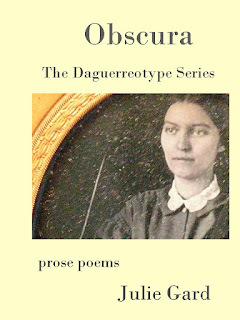 Julie Gard’s Obscura: The Daguerreotype Series is a mysterious and rich literary photo album. Each ekphrastic prose block reinforces—by its elegance of phrasing, by its very shape—a meditation on the visual. Gard’s writing is crisp, elusive, nuanced, and shadowed. Obscura is a gorgeous book. Julie Gard’s remarkable Obscura is a series of precise, delicate and searing portraits. Gard looks deeply into each daguerreotype and finds the compelling idiosyncrasy in each face. Her writing is at once distilled and generous, whether she is describing Emily Dickenson or an anonymous child. Julie Gard’s honest, provocative, haunting images mark her as a writer to follow. “The process was science and alchemy,” Julie Gard writes in Obscura: The Daguerreotype Series. And in these lyrical portraits, she weaves a similar blend between the precision of description and the transformative empathy behind the act of imagination. In deft and painterly prose, Gard captures the wildness and longing within each unknown, human life.